A bargain for such a great location this close to the beach - just a few hundred yards away! Close enough to hear the sound of whales flapping their tails on the water. Stunning open views (no exaggeration) of the spectacular peaks of the 7000' Sierra Laguna Mountains and the wide, open Pacific. You don't even have to go down to the beach to enjoy it - the porch and roof-top terraza (preferred by many guests) bring it to you. A private beach bungalow located in an undeveloped area just north of Todos, it provides the seclusion of nature just 10 minutes from all the activities downtown. Located on 2+ acres and adjacent to 90 undeveloped acres of cactus forest, it's behind a locked gate for security, privacy and NO road dust to choke on or traffic noise or roosters crowing at dawn to wake you. An exceptionally peaceful location, a natural setting with open landscape - and did i mention the expansive views? Summer, fall and spring special rates. *Margarita glasses and salt included! (You bring the tequila). * Full water pressure with plenty of hot water in walk-in shower, that also waters the desert garden. * Chairs and recliners available for lounging on the porch or terraza/roof top. * Hammock for the beach side in the shade. * Daily afternoon breeze through ocean-side French doors to cool you, or wall or ceiling fans. * French doors and screen doors are heavy metal with secure locks, to leave open all night, if desired. * Stairs to terraza provide a view of entire coast line of the Pacific and Sierra Laguna mountains, or just sit on the corner of the front porch and soak it all in. Great spots for sunset and star gazing after a day on the beach. * Beach umbrella, beach mats, canvas chairs, cooler, mask & snorkels and boogie board available for beach trips are stored under patio. *Gas BBQ - ask Luis to get it out when you arrive. Sleep to the soothing sound of surf crashing and wake to doves cooing. You´ll love strolling along the white sandy beach, watching the whales breaching right off shore. If you prefer birding, from your porch watch osprey perched in the old-growth cactus, resident baby quail or road-runners skittering across the road and cardinals and Orioles feeding on the agave in the yard. The star gazing is a must. A very peaceful setting. Plus, it's green: solar for electricity and sink and shower water goes out to the garden - and we emphasize growing native, protected, water-conserving species at our place. The local 16% IVA Tax is included and we have a Mexican business license to operate. We're legal! Surfing, swimming, fishing, shopping, snorkeling, beach combing, hiking, biking, horseback riding, great dining are all available in the area. Todos Santos is an eclectic mix of artists, musicians, surfers, organic farmers, fishermen and rave-reviewed chefs that you'll want to try! Classes in Spanish, yoga, meditation, Tai Chi, cooking, art, surfing and kayaking available. This interesting cultural blend provides a variety of interesting galleries, restaurants and eco-experiences to choose from. One of our favorites is helping release baby sea turtles back to the ocean in fall and winter, just up the beach from our casita. You can even volunteer to go out on ATV in middle of the night to recover turtle eggs from nests and help rebury them in the refuge green house. Contact us for an affordable vacation spot and info on the local attractions. We always wanted to retire in Mexico some day. We found the property and wonderful community of Todos Santos and knew we were home. We purchased in 2004, then built our casita in 2011 with a lot of patience and love. Our plan is to eventually spend most of our time down there, retirement in paradise! We adore the Mexican culture, the Spanish language and the outdoors. Being an ecologist and science teacher, we are drawn to the plant and animal life. We spend most of our time outdoors in Todos Santos, even if it's just swinging in the hammock and reading. Our girls enjoy it also and have grown up exploring the beach and helping with many baby sea turtle releases and egg recovery. And we're happy to help you connect with nature on your visit. Situated in a desert oasis, the area provides great ecological diversity in plant and wildlife Our casista also affords privacy unlike most houses this close to Todos Santos, due to the undeveloped neighborhood with a cactus forest. The views are beyond comparison (read the reviews). We wanted to be close to the ocean and nature, yet near social activities and some culture. Our casita near Todos Santos provides the perfect combination, the best of both worlds. 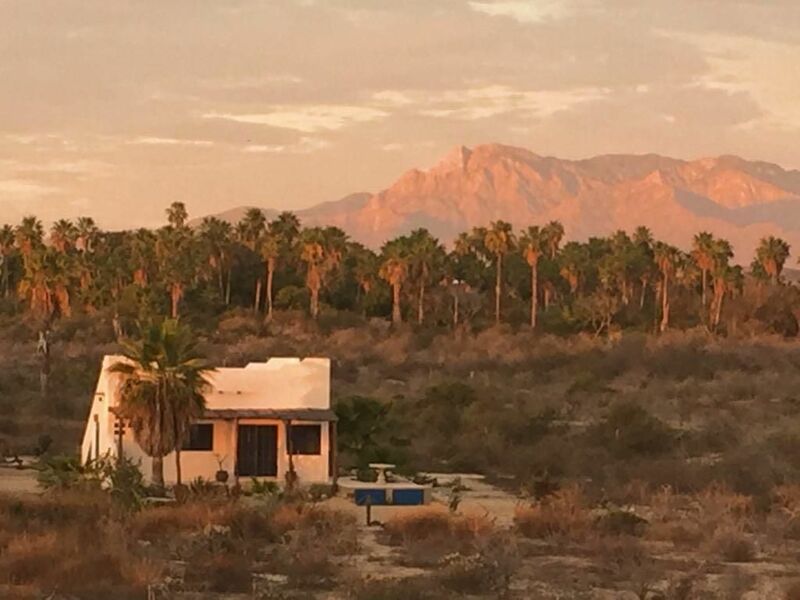 Situated near the desert oasis of Todos Santos, Casita de Luna has privacy, off-road parking, NO dust or traffic & is gated for your protection and greater sense of security. None of those puny views where you can only see it from one corner of the house! A nice porch facing the ocean and wrapping around to face the 7000 ft Sierra Laguna mountains, and a rooftop terraza with 360 degree views provide optimum space for dinning outside or having sunset drinks. Hammock, recliner, chairs and table available for your extensive hours outdoors chilling. The house is open and airy, with French doors that open onto the porch and allow refreshing breezes to flow through the house. You can even watch whales breaching in the Pacific while washing dishes- close enough to hear them flop! The walk-in shower has plenty of hot water and pressurized for a full flow. Bordering 80+ acres of undeveloped, cactus forest provides one of the best natural settings around Todos. Wildlife abounds, including grey foxes that have denned nearby and osprey that catch their fish and perch in nearby cardon cactus to feast. Not to mention the whale migration and turtle nesting! Mountain biking and horseback riding right in the neighborhood. Todos Santos is a small, friendly community that will engage all your senses and interests, in a relaxed setting! There is an interesting blend of international (US, Canadian, Italian, French) and Mexican cultures here that has produced an eclectic art, entertainment and food scene in town. Some other products of this cultural cross-pollination are the Todos Santos music festival, with both Latin and rock music (in mid to late January), the Festival del Cine/Movie Festival (in March), the gastronomical festival (in spring), and a Mango festival (in summer), as well as many festive Mexican holidays. Casita de Luna is the perfect home base for your day trips into the Sierra Laguna mountains, the old mining town of El Triunfo, La Paz and even busy Cabo San Lucas. Walk-in shower with bench (to sit and wash your feet) and plenty of shelves and racks for towels and toiletries. Bathroom sink outside of toilet/shower area for easier access when shower or toilet is occupied! El Centro in Todos Santos is full of old architecture, including a tour of the 12 Saints/Santos de Todos Santos. Shopping abounds, as well as nice restaurants and taco stands. About 2 lots away or 200 yards from the beach. A wonderful view of the Pacific from the newly expanded porch or rooftop terraza. We are only 10 minutes from town, but on the edge of 90+ acres of open cactus forest that hasn't been developed. Yet. Todos Santos - a destination resort town and Mexican designated "Pueblo Magico" with history, art, culture, destination restaurants tucked in the great outdoors. View waves splashing on the beach through the bocana (break in the dunes) - or walk a few hundred yards down to sit on the dunes or the beach. Close to the beach - just 2 lots away! Often empty for sunset strolls. Open view to the east of the Sierra Laguna mountains - from porch, roof-top terraza or most windows in the casita! View from front porch, windows and roof top terraza - watch whales migrating by from November to April. Great view of whales, dolphins, bat rays, pelicans, you name it. No telephone but there is excellent cell phone coverage. A land line will come with Telmex wifi hook up in the fall. No heating needed, we're on the tropic of Cancer! King and single bed linens provided for 2 twins together for king or separate. Nice comforters for the occasional breezy winter evenings. Telmex Internet wifi available. We also have good cell phone coverage at the casita, if your plan covers Mexico. Password on front of info book on the wall. Full sets of towels, bath mat, beach towels and bamboo beach mats provided. Wifi password on front of info book on the wall. Sofa that turns into a double futon bed. But we spend all our time outside in the patio rockers on front porch, or up on the rooftop. Gas stove with oven. Small gas BarBQ available on request. Small gas 4 burner stove with oven. Mr. Coffee and french press, as well as drip pot. Basic condiments available: salt, pepper, ground garlic, spices, vinegar, oil, sugar, rice, tea (please replace if you use something up). Full service for 8: plates, bowls, small plates, mugs, glasses, wine AND margarita glasses, silver ware, paper napkins and towels, dish towels provided. Everything you'd want for creating a meal. Plenty of cooking and serving utensils available - everything you'd need for cooking up fish fresh from the fishermen's boats! Even margarita glasses. Adjacent to kitchen and living area, with french doors opening toward the ocean view. Best dining spot is out on the newly expanded porch with table and chairs, to view the sunset and whales. Small Ipod speaker available for 30 pin. Bring an auxiliary cord if you have newer connectors. Big box of books, various subjects. Great for sitting on the porch or rooftop terraza while basking in the warm sun! Plenty of board games available: Scrabble, Rummikub, Connect 4, Boggle, Mancala, Dominoes, Pinochle, Uno, cards, etc.. There are DVDs, but no player. We bring our laptop down and play them on that. Desert landscaping, to save water resources! Which leads to great encounters with osprey, road-runners and the cutest quail you've ever seen! Beautiful view of the Pacific whale migration from porch or roof top terraza, or view the beautiful Sierra Laguna mountains to the east. Great for meditation, yoga, a nap or sunset drinks! Sea kayaking lessons available in town through various eco-tour guides. Rentable in town for all occasions - mountain biking or town touring. Go to Adventure 19, near Pemex gas station. Many people hire the local fishermen to take them out on the water - they know the local waters well and the best fishing places! Luis, our property manager, can help you set up a trip. French doors open onto porch with expansive view of the Pacific and Punto Lobos to the south. Rocking chairs and hammock are available to enjoy it all day, as many guests have done. Newly expanded porch right out the kitchen/dining area doors for easy dining. Spend hours on the front porch, lazing in the sun, reading and watching migrating whales and dolphins. Snorkeling masks, snorkels and fins provided, along with beach mats, cooler and umbrella. All under the porch storage area, accessible with red key. Kayaking available in town at La Sirena Adventures. In Cabo San Lucas or La Paz. On 2 acres with gated side road for security and adjacent to undeveloped acres of old-growth cactus, will give you your perfect privacy and keep you away from road dust and with minimal neighbors. Eighty acres of cactus forest to our south and 16 empty acres to the east. French doors open onto front porch with full, beautiful view of the Pacific ocean and Sierra Laguna mountains to the east. Fully solar powered with full water pressure and plenty of hot water! There is no way to lock keys inside of house. Set up a time for property manager to meet you to check out/return keys. Part of your deposit will be charged if house is left open. Thanks for understanding. We had a great experience. From drinking coffee and watching whales from the deck. Or walking the beach. We had a very good time. The whole trip was very easy. Lovely home near the beach with all the amenities you could need for a simple holiday. Very clean. Private and independent from the other houses. We had a great experience. The ocean roars and roars day and night. Stay at this primo beach house and experience it all! Everything you would ever want to "get away from it all". Peace, quiet, nature and the beach right out of your front door. Just spent an amazing week with the family and couldn't ask for more! "Reconnecting" with the family has made it a priceless getaway as we were able to ditch the phones and computers and replace them with board games and many hours on the beach together. We were able to sample some of the best foods we have ever enjoyed in town with super friendly locals and really get into the lifestyle. Cathy's casita proved to be a perfect home base for a perfect vacation. We are already planning our return! We just returned from our trip to Baja and I would definitely recommend the Casita de Luna to friends! Its located on a nice quiet spacious piece of land a little north of Todos Santos at the end of a sleepy beach road. You might see a few other people other around but you definitely feel the peace and quiet with waves crashing in the background! The casita was very clean and had all the supplies needed to make dinner and lounge on the porch. The cooler and beach umbrella were also extremely helpful on our beach adventures! It really is a very peaceful place to stay. Also Cathy was an excellent host!! She responded to all my questions and emailed a helpful info sheet with directions to the casita and places in the area where to pick up groceries, beaches to visit , etc... It's just perfect! Thank you Cathy! We are located 10 minutes outside Todos Santos, about 45 minutes north of busy Cabo San Lucas, in the state of Baja California Sur. It is a destination tourist and scenic area with spectacular views every where you turn: historic mining town, waterfall, 7000 foot peaks in the Sierra Laguna mountains, pristine beaches, desert oasis with palm trees, expansive cardon cactus forests, cliffs along desert arroyos, a lagoon with plentiful and diverse bird populations. An abundance of natural wonders. Whale watching, baby sea turtle releasing, beach combing, kayaking, snorkeling, hiking, back packing, bird watching, horseback riding, star gazing, you name it, our area has it. Including shopping at boutiques and art galleries in Todos Santos - with complete range of restaurants from taco stands to international cuisine, and historic sight-seeing opportunities. Tour through town to see the dozen statuettes of the Todos Santos or All Saints. Many beaches you will have all to yourself. I'll help you with local information for your specifics needs - just ask! Todos Santos also has many intriguing festivals throughout the year that are worth attending. There is a music festival in the third week of January with many bands from US and Mexico, an Arts Festival in February, a wonderful Film Festival/Festival del Cine the first or second week in March, a Gastro Vino Festival in May and a Mango Festival celebrating everything mango the last weekend in July. You can google these events for more information and specific dates. Come check them out and enjoy! We require a $100 US dollar damage deposit and $20 cleaning deposit given to the property manager upon arrival, if not paid through VRBO. He will return damage deposit to you when you leave if no damage has occurred, other than small incidental wear and tear. The cleaning deposit also is returned unless you leave the place trashed. which has happened only once. A 3% fee added for credit card charge when paid through VRBO.Thanks.